One more year we are in the service of Institutes so that their students can take multi-adventure excursions. At LO RUFETE, every year we increase activities and adapt the park to school needs and methodologies. If you make your reservation before October 2, € 1 per student will be deducted. - If there is free time, students can play games. We remain open to any change in activities. To the teacher: Participate in any activity, food and free wi-fi. Recommended material: Bring plenty of food and water, swimsuit, towel, change clothes, sunscreen, hat and closed comfortable shoes. Opening hours: 10:00 to 15:30 h.
Development of the day: The instructors of LO RUFETE, pick up the students when they leave the bus, divide them in groups of 10-13 students per monitor, then they are accommodated in the room equipped with tables and chairs where they will be for breakfast, lunch , rest and leave your belongings while doing the activities until the departure time of LO RUFETE, once installed have breakfast, at the same time they have breakfast, they get to know the monitors and adapting to the environment, it is now when they distribute the bracelets with a color for each group, which will henceforth be the hallmark of each group. After breakfast we start the activities in such a way that each group is doing a different activity, at the end of the first activity all the groups change to the next activity and so on until all the activities are finished, say that for the activities of (paintball , quads, zip lines and horses) have support monitors in addition to those that go with the group. 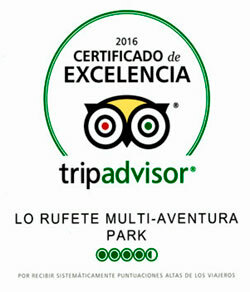 We are also pleased to invite you to visit the park.